Marathon adjustable drain guards are sized to fit all drain openings to lock out stones and debris with two quick twists of the wrist and prevent costly drain clogs. Made from sturdy cast aluminum the dome and stainless steel hardware are able to withstands extreme conditions. Manufactured to fit drain openings from 2-1/2" to 8" with the choice of four drain guard dimensions of 5", 10", 13" and 18". Solved my problem, works great but it's about 8 inches tall. According to specs it was supposed to be 3 inches tall. 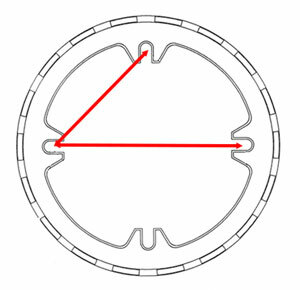 "The dome height is 3" and that is what is shown online when you reference the drawing.The overall height of the dome AND the scissor mechanism is close to 8". So, it is as described. We are glad it worked for your application."